It's always a challenge to keep your hair dry and looking good in rainy weather. An umbrella is useful, but is sometimes cumbersome. Some raincoats can be heavy and unfashionable, and rain hats equal instant hat hair! Her dilemma – “How to bring all your favorite coats out of the closet and still protect your hair from the rain? Hood To Go is the perfect solution, a stylish way to protect your hair by adding a hood to any coat! The hood is attached to a mini vest that when worn under a coat or jacket is virtually invisible and adds no bulk. The fabric is water resistant microfiber. 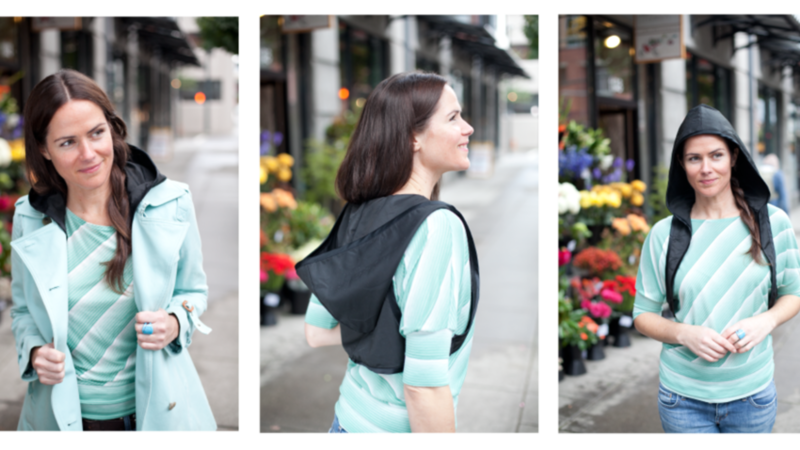 Hood to Go is patented and made locally in Portland, Oregon! One size fits most and it's packed in it's own little pouch.